Learn the concepts underlying massage and bodywork for clients who have edema, including an overview of lymph drainage and important steps to preventing lymphedema. This course does not teach hands-on skills. Identify the major anatomical components of healthy immune and lymphatic systems. Distinguish between the body's normal inflammation process and abnormal edema. Identify the indications and contraindications for working with clients who have edema. 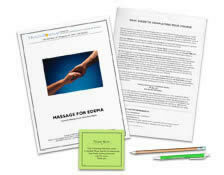 Provide the client with information on prevention and management of lymphedema.